Consignment season is right around the corner! With three kids, and a “never pay retail” mentality, the seasonal children’s consignment sales have been a real blessing. I first discovered consignment sales 8 years ago when my oldest son was a year old, and I was pregnant with my daughter. Since then, I have shopped sales each fall and spring to get everything we need for our growing family. I’m also a consignor so I can clean out what we no longer need, plus I get to shop the pre-sales that way! Now its time to clean house and get my items entered into the system for the upcoming consignment sale. There are a few tools that every consignor should have on hand. 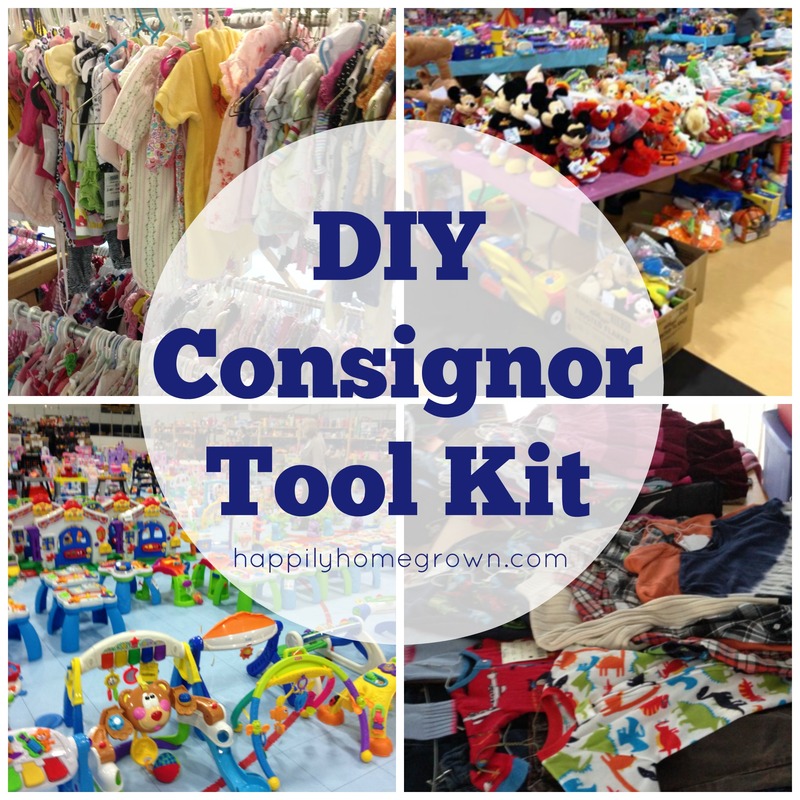 By creating your own consignor tool kit, you will have all of the items you require at your finger tips ready to go each consignment season! Wire Hangers – Different sales have different rules regarding hangers. While many will allow you to use plastic hangers, I still prefer wire hangers. They move more easily on the apparel bar making it easier on shoppers. You can also fit more items in a smaller amount of space because they aren’t bulky. If you are selling multiple pieces, its easy to put each piece on its own hanger and then run a wire tie through them to keep them together. I usually order my hangers from Amazon when I need to fill in from previous sales. Tagging Gun & Barbs – While you can attach your tags with safety pins, I have found it is much easier to use a tagging gun. I purchased a kit that comes with the tagging gun, replacement tips, and barbs and it has been a lifesaver. Safety Pins – While I don’t use safety pins to attach my pins, but I do use them to hang pants and skirts to the hangers, as well as for keeping multiple pieces of an outfit together so they don’t get lost. I like using larger safety pins because they are easier on my fingers. 90# White Card stock – If you are printing your tags at home, then you want to use 90# white card stock unless your sale tells you otherwise. The 90# stock will hold up to the tagging gun, and people rummaging through the racks without the tag ripping off. Stick with a matte white so that the barcodes that print off are easily scanned. If you have a print service print out your tags, then request 90# stock from them. Zip Ties – You can get packages of inexpensive zip ties on Amazon. You don’t need the really good ones for doing wiring work. Use these to hold shoes together, pieces of toys, or even connect multiple hangers. Ziploc Bags of all sizes – Ziploc bags are the toy consignors best friend! All of the little pieces go in a single bag. Use a strip of packing tape over the bag closure, and then another piece of tape to attach the tag. The shoppers can see what they are getting, but the pieces won’t get lost. Ziploc bags come in a multitude of sizes, up to heavy XL bags that are big enough to hold hockey skates! Magic Eraser, Clorox Wipes, and Bleach Pens – You need to make sure all items you are trying to sell are clean. Magic Erasers remove crayon, and the dark spots from oils on your skin. Clorox wipes are perfect for a quick wipe down of all baby gear and to remove food stickiness from highchairs and even car seats. Bleach pens allow you to take care of small stains on clothing and linens that would otherwise prevent you from selling the item. Batteries – Battery operated items sell better when there are actually batteries in the item. Go to Dollar Tree and purchase your batteries there. 18qt Sterilite bin – I use a large Sterilite bin to keep all of my consignment tools in one place. When it is time to hang & tag all of my items, I grab my kit and am ready to go without having to hunt around the house for everything. Keep your Consignor Tool Kit in the bottom of a closet where you will begin gathering all of your items to consign, and you will have an effective and organized space to turn your no longer needed items into a paycheck for what your children need in this season of their lives.